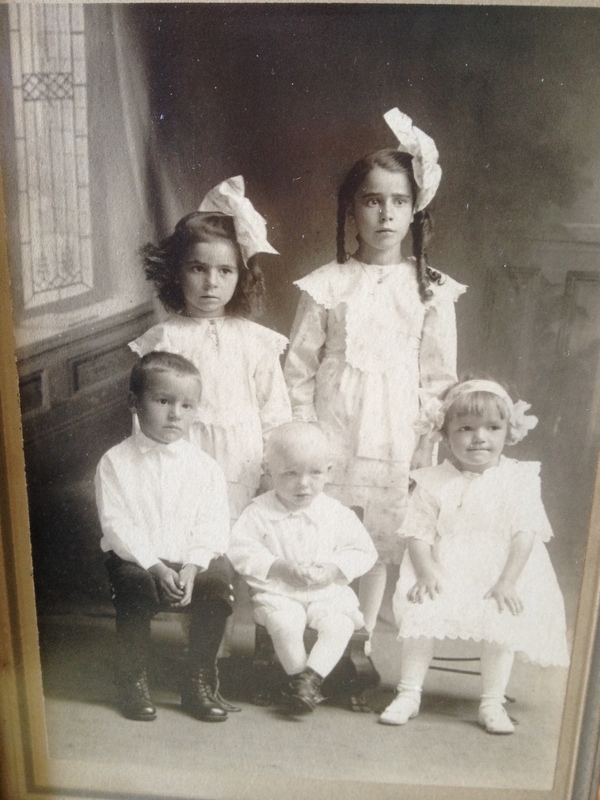 Great Aunt Mary (upper left) and her siblings, c. 1920. Grandpa Koshere was not born yet. 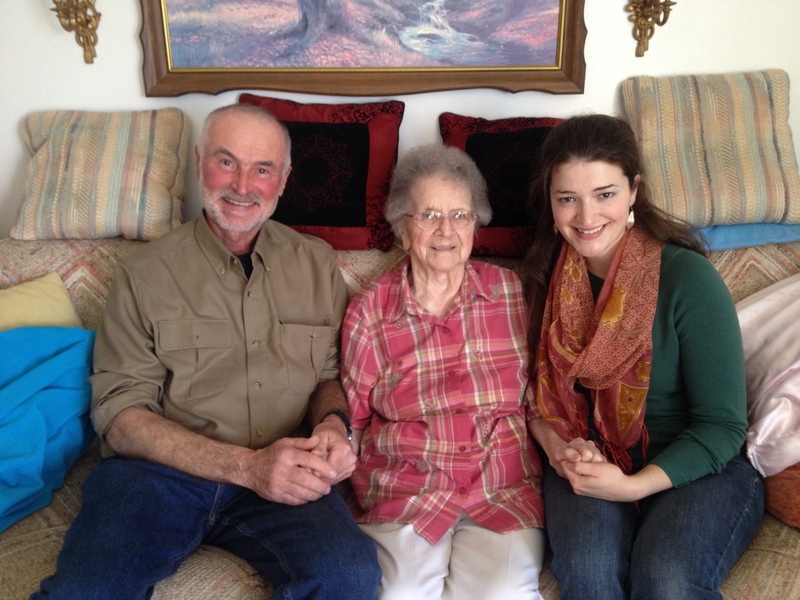 The things my great Aunt Mary credits for her 101 years are love, laughter, humor, blueberries, and sardines (two cans a month). She was born on this day in 1913 to Slovenian immigrant parents in the Iron Range town of Chisholm, Minnesota. Her youngest brother, Frank, was my father’s father—Grandpa Koshere. I recently visited her with my dad and stepmom. Before we came she warned us she would look different from last time; it had been a year since they last saw her and four since I did. She still lives in her own apartment on the third floor of an assisted living home, where she’s lived for the last 30 years, but she spent a few days in the hospital four months back. She said she’s lost weight, and her left hand’s no good anymore. When we arrive she greets us at her front door with her walker. Her body is smaller than it was, but she stands straight. Her hair is still amply shaded by black pigment (it’s eating fresh vegetables, she says, that keeps some natural color in with the gray). Still, I can tell she has lost some of her strength. When we hug, she looks me over and then points down. “Look! I used to have such nice strong hips. Now I can hardly sleep on ‘em, they’re so bony.” Her left hand does seem to be limited these days—stroke? arthritis?—yet her eyes are deep-set and have what I always remember about them—a decisive, enthusiastic shimmer. We unwrap a package of smoked Lake Superior ciscoes, a loaf of marble rye, and a bouquet of yellow flowers. She makes us coffee and serves us cupcakes—she baked them, and made the frosting, last night—and as we peel the skin and bones out of our smoked fish, Aunt Mary tells us stories. She tells us about when my grandfather, Frank, and their brother Vic went off to the War together. There was that one night in France when Frank was standing guard, and it was so cold. He was so cold he wet his pants. He was so cold he couldn’t raise his arm to salute the commanding officer, a real devil of a guy. He worried he might be court-martialed for that. When Frank and Vic came back from the war, Aunt Mary’s husband got them jobs in the mines in Chisholm, and they came to live with her family on the farm. Every month Frank and Vic paid $40 each for room and board. Aunt Mary would use twenty and save twenty. On the farm she slaughtered pigs and made sausage. She fed Frank and Vic good bone-broth soup and baked them apple strudels. When Vic moved to Milwaukee a year later, and Frank a few months after that, for a factory job at Harnischfeger, Aunt Mary gave each one the savings that grew from his $20 a month. They had eaten well living with her, and before they moved her husband took them each to a men’s department store to fit them for some new clothes. She weaves back and forth in this story. She often returns to when they first came home from the War. They were so skinny. She told them, “Tonight you’ll stay in a house and have a warm bed and a good meal.” Her eyes fill and shine. My dad’s and mine follow. Her stories of my grandfather are in some ways an exception for Aunt Mary; we know when Grandpa Koshere was born, when he went to the War, and when he passed (I never knew him: lung cancer, 1984). But something I rarely know about her other stories is when in the last 101 years they took place. There was the lake she used to swim across. One time—it must have been in eight, nine, feet of water—she looked down and saw a boat on the bottom, all filled with sand. She called up the boys, and they were able to get that boat out of the lake and hauled up on shore. The boys put the boat up on the hill for her, and she filled it with soil and flowers. From that point on everyone called it Mary’s garden. She planted so many flowers in that boat over the years. Listening to her is like going swimming with her, flowing from 1927 to 1983 to 1949 to 1998, and perhaps all in the same breath. Decades ago, days ago? You never quite know. So I can’t relay the chronology of when she found that boat at the bottom of the lake, or begin to guess who she means when she refers to the boys; there are a lot of family members I don’t know. But I do know how those people and those stories made her feel, how they make her feel still. Does it matter if she’s talking about 1972 or 1930? She’s laughing now. She’s crying now. What persists are the feelings of things. Then, a sliver of a pause—and it’s on to the next tale. It seems her pace only increases the more stories she tells. There is so much to share, and only so much time for sharing. She can’t form the words fast enough. Suddenly her telling is doing something noticeable to her whole physical presence. Her eyes shine, her forehead rises, and her voice speeds. There’s a good word for Aunt Mary as storyteller: lively. Of life. As she approaches the edge of a lifetime, I can’t help but see her stories as her vitality itself. To watch her tell them, you know they keep her blood hot, they keep her voice on. Her stories give life to a grandfather I never knew. They bring flowers back to gardens long gone. They return her, and they ground her. Her stories are the life she stands on. Aunt Mary’s vitality is a teacher for me. What matters more than stories, I wonder? But then I think of how lucky Aunt Mary truly is. She’s a rare one who lives, this long, to tell the tale. What happened to the stories that preceded her? And what’s going to happen to hers? Does a lifetime of stories set like the sun? Think of all the stories that are gone—paper burned, ink blotted, memory lost. Think of all the voices that no longer exist to tell them: disaster, famine, war, genocide. Think of all the, all the, stories obliterated from this planet. What, really, do hers—do any of ours—matter? The letter Aunt Mary received from President Obama on the occasion of her 100th birthday thanked her for the vital contribution her life has made to the American narrative. The American narrative. That’s an idea I want to take comfort in: the threads of her stories live on in a broader tapestry. But is that all? Is that enough? Her story contributed to the American narrative, but her people came from Slovenia. Another letter arrived for her on her 100th birthday; it was in Slovenian, and she could read it. Hers is also an immigrant narrative, and a Minnesotan. A Catholic’s and a woman’s. A story can be named and named. Naming the universals of a life’s story gives me comfort and discomfort, and for the same reason: we call out the universals because our details will, someday, be lost. We’re going to lose them, or our children will, or our great niece will. What stories do is end. What stories do is keep on. What stories do is find new details. And what we live for, what our stories and our voices are for while they’re here, are the details. Happy 101st birthday, Aunt Mary. I enjoyed this very much Lauren. Boy, 101! It sounds like she is doing pretty well. Sardines, huh? Kadence will probably live to be 120! The photos were fun to look at also. Hope that you are doing well. Just reading this again. Thoughtful, sensitive, memorable, excellent.